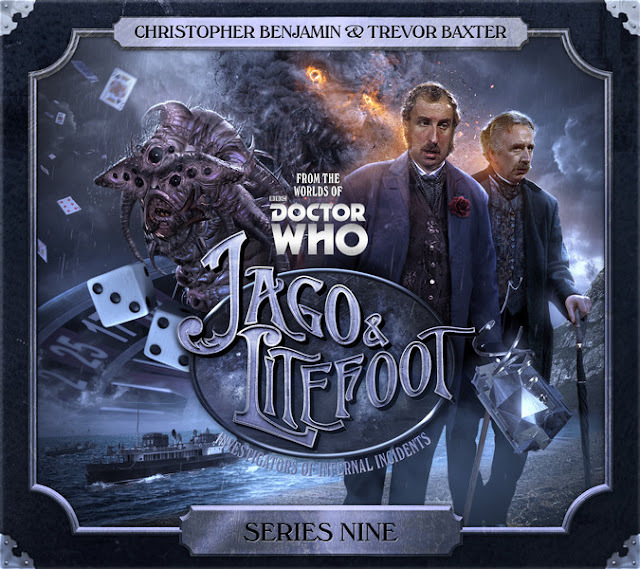 Big Finish: JAGO & LITEFOOT, Series 9 Review | Warped Factor - Words in the Key of Geek. Tony’s riding along on the crest of a wave. What could possibly go wrong? At the end of Series 8, we left Professor Litefoot and Henry Gordon Jago about to embark on a cruise, to get out of London and recover from the events of that series and their possession by the Darkling Façade. Jago and Litefoot, trapped on a ship. Cruise of Creepy Doom, anyone? As with the last series, this one gives us two relative stand-alones stories, followed by a two-part story – a formula that can work well to vary the pace, or, as in some cases within the run, can give listeners the sense of our heroes having forgotten about the hook that led into the scenario of the series for those first two episodes. This is not going to be your ordinary cruise, clearly. Morris’ script is laced with both danger and humour – yes, we get the chance to hear Benjamin and Baxter trying out a series of cod accents, but we also get a sense of the dimensional danger inherent in so many Jagos and Litefoots from different realities being in one place at the same time. It’s not quite a Blinovitch Limitation Effect moment (obligatory high-geek reference), but there’s plenty of potential for timeline-unravelling danger nonetheless. It’s a well-paced adventure to establish a new tone in this series, and apart from the central drama, it also takes the time to establish several leading characters that will, unusually, be with our heroes throughout all four stories, including Aubrey, the ship’s purser, played by Jamie Newall, the inestimably dull Neville Tibbs, played with fastidious snippiness by Dan ‘Sontaran of the Century’ Starkey, and the fabulously licentious Lady Isobelle Danvers, (played with almost Wodehousian relish by Sarah Badel), who directs her attentions towards both Litefoot and more specifically Jago. The Devil’s Dicemen by Justin Richards is a delicious, dark tale of potential diabolical games of chance in a Monte Carlo casino. There’s a hint of Bond about the story’s setting, but with the arrival of David Warner as Dr Luke Betterman (Big Finish continuing its tradition of oddly character-descriptive names in the Jago & Litefoot stories), the tone reverts to solid, intriguing J&L, the diabolical set-dressing (listen our for Miranda Raison as Madame Diabolique) is stripped away and the real intent of the Devil’s Dicemen revealed. There’s a similarity here to The Skeleton Quay, Jonathan Morris’ Series 6 opener, but here the atmosphere is tighter, the plot more taut and intriguing – and did I mention, there’s David Warner, who makes absolutely everything he’s in about six times better than it would have been without him. As with the first story, it feels like a fast listen, and it’s deeply engaging throughout, keeping the listener guessing all the way through as to who’s on which side of the fence. Island of Death, by Simon Barnard and Paul Morris, kicks off the loose two-parter that closes out the cruise with a trip to a mysterious island where – not to put too fine a point on it – people die. There’s a solid dose of possession by a supposed tribal god, Sarah Badel in particular carrying much of the weight of the storytelling for at least the first half of the episode, with Christopher Benjamin as Jago showing a softer, more tender side to his character without turning our confirmed bachelor to mush. There’s a traditional volte face and a spot of cackling mad acolytery here too, one of the other travelers on the Fata Morgana knowing more than they have let on up to this point about the island and what they discover there. But does the island really harbour a god? And what’s the connection between the island and the reason the cruise is being run in the first place? Finally Return of the Nightmare, Justin Richards’ second episode this series, explains how the dangling threads of the previous three episodes tie together – and most of the episodes have a part to play in explaining the puzzle. More of the travelers turn out to have their own agendas and to know more of what’s really going on than they’ve ever let on – as with each of the previous episodes, Return of the Nightmare keeps us guessing right to the end as to what is really going on, and there’s more than one red herring to track down and uncover before we’re done. Tonally, there’s a uniqueness about Series 9, the cast of new but recurring characters giving the series a particular insularity that actually works well as a framing device for Jago & Litefoot – perhaps perversely, given that their usual purview is the streets of Victorian London, Jago & Litefoot seem to be most focused, most enjoyable when they’re out of their traditional environment – we found it with Series 5, when they were catapulted forward to the Swinging Sixties, and here too, on a voyage to Foreign Parts, Jago & Litefoot get a chance to grow in new worlds with broader recurring casts than their home team of Inspector Quick and Ellie Higson. The quality of the scripts helps this series to feel like one of the more memorable and enjoyable, and there’s a tightness to the pacing of each individual episode that makes for an effortless but highly engaging listen. We’re almost left wishing the infernal investigators would stay at sea for Series 10, and a little apprehensive about what happens next, having hit another high spot in the run like Series 5. But the headline is simple – this is a high spot in the run. Go get yourself Jago & Litefoot, Series 9 today.